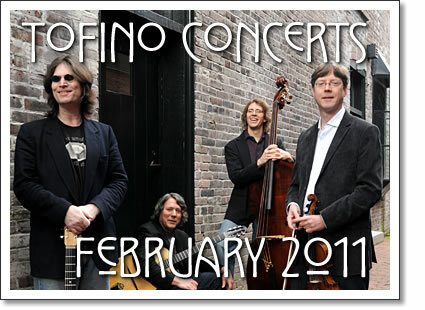 The following concerts in Tofino are happening in the month of February 2011. Tickets for shows at the Tofino Legion are available at Tofitian and Long Beach Surfshop in Tofino. Tickets for events at the Maquinna Pub are available at the door. ﻿OKA is a celebration of Australian cultures, sinking deep into the roots of the Asia Pacific region. The OKA sound is deeply rooted in the laid back coastal style of their down under home. Their signature is a smooth hi-fidelity sound that is full of beautiful uplifting melodies, tones and textures cooked over raw didgeridoo rhythms and phatt dance driven grooves. A live collective where no two gigs are the same, the oka flavour is their own hybrid of feel good Roots, Reggae, Dub and Jazz, marinated in Electronica and served on Island Time. OKA hypnotic, high energy live performances are a spontaneous exploration into the sublime. They consistently set themselves apart as a festival crowd favourite with their originality, honesty, and passion. ﻿From their seaside hometown of St. John’s, Idlers have been loading and unloading the great green pickle-van to bring their foot moving skank and polit-reggae-ska-rock to cities and towns from coast to coast and everywhere in between. With anything from a 7-piece onslaught of sound to a cozy and groovy 11, Idlers conscious sound has earned the group fantastic reviews of their live shows, 2007 release Corner, and their latest release, Keep Out. Idlers will be back in the studio later this summer, but first they’ll be on the road, playing across the country in support of Keep Out. Idlers are coming to Tofino! Van Django is an acoustic string ensemble made up of four of Canada's talented and eclectic musicians. Inspired by the gypsy jazz made famous by the Hot Club of France in the ‘30’s, their music has a driving and rhythmically inventive force which borrows from many musical influences. Members are: violinist Cameron Wilson, guitarist Budge Schachte, guitarist/cellist Finn Manniche and bassist Brent Gubbels. Tofino concert listings from Tofino Time Magazine. Shows at the Tofino Legion and other music events in Tofino in February 2011.